We had a small family party for Emily's actual birthday. She got to choose what she wanted for dinner. She picked her absolute favorite meal - BURRITOS!!!! 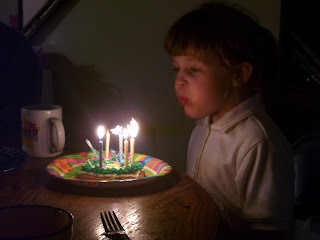 We had cake the night before, so I wanted to get her something sweet to put a candle on. I got an Easter cookie at the grocery store. Perfect fit for 6 candles. What a sweet girl! I love this picture.